The Bunny Bungalow: Ahh, An Extra Hour! 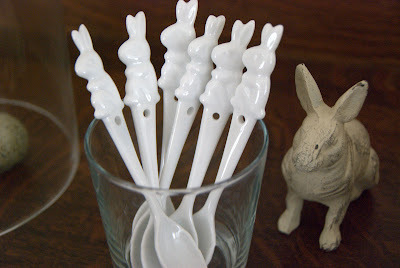 Small porcelain bunny spoons from Sur La Table, Houston. After all, what's time to a rabbit? The end of daylight saving time means we have an extra hour. What to do with it!? I have "spent" that hour a dozen times this weekend. So, now I think I shall spend it yet again, visiting blogs I love. See you Monday, an hour later, of course. Gotta have them. I love and collect bunnies. I have many figurines, but where oh where did you find the spoons? I found them at our Sur La Table, here in Houston. I noticed they aren't on their website, though.